I have recently become obsessed with Subway’s White Chocolate Macadamia Nut Cookies, but given that they are 6 Points each (according to my handy Weight Watchers Dining Out Companion), that’s just not a treat I can afford to indulge in often. So I’ve been baking away in the kitchen trying to come up with my own knock-off version for a healthy White Chocolate Chip Macadamia Nut Cookie Recipe, and boy oh boy was I successful! Each cookie is just 2 Points, making them an ideal low calorie snack to indulge in. It took me a few tries to get the ingredients just right, and in my attempts, I realized that I couldn’t use certain types of butter substitutes and/or egg substitutes. So I had to figure out a way to fit all the good ingredients in, but still keep it a low calorie, low fat cookie. 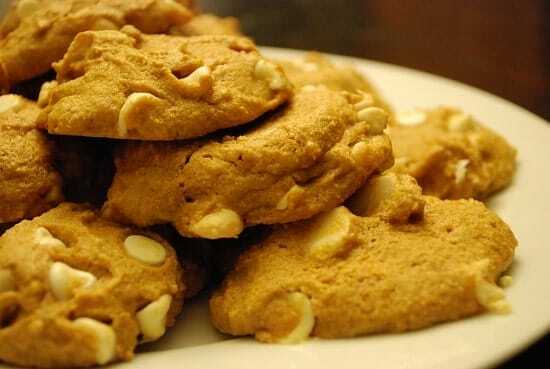 In the end, an amazing, low Points White Chocolate Macadamia Nut Cookies Recipe was born that tastes just as good as the higher fat version, but is a lot better in helping you reach your weight loss goals. Now you can have your cookie and eat it too! Enjoy! A divine way to satisfy your sweet tooth, these low Points White Chocolate Macadamia Nut Cookies are soft, chewy and just 2 Points each. In a medium sized bowl, combine the butter and sugar and smooth. Then add in the egg, the vanilla extract and the almond extract. In a large bowl, mix together the flour, salt and baking soda. Slowly stir the sugar mixture into the flour mixture and stir until combined. Stir in the white chocolate chips and nuts. Drop the dough by tablespoon onto cookie sheet. There should be enough dough for 24 cookies. Bake for 10 minutes. Remove from oven and let sit on cookie sheet for another 10 minutes before transferring to a wire rack to finish cooling. omg! these cookies are amazing! Tried making this last night,doesn’t look anything like this. :( I haven’t even try eating one,yet. These look amazing! I joined WW about 3 weeks ago and have made quite a few of your recipes and each one has been so good and flavorful! Thank you for doing all the work for us!